Libella Bedwear in Singapore offers a variety of sleepwear/pajamas for both adults and children. Libella Bedwear specialises in these bedwear products, using 100% top quality cotton fabrics. Why cotton?..because it has high absorbency rate and breathes well, which is ideal for a warm climate. 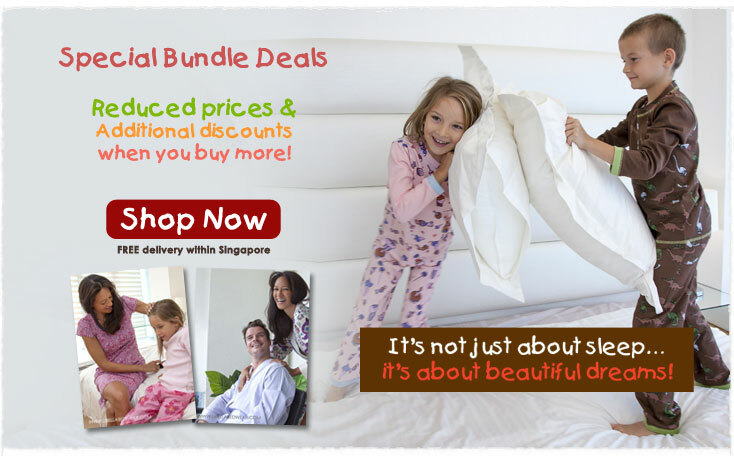 Libella Bedwear in Singapore offers a wide and luxurious variety of bedwear for the whole family. Adult sleepwear can be very comfortable as one winds down after a hard day at work to finally relax. Children, on the other hand, can slip into comfortable pajamas to sleep through the night. We believe that when parents and children wear similar sleepwear, it enhances parent-child relationship and strengthens bonding. This would make the bedtime ritual a more wholesome experience for the family. Hence, Libella Bedwear creates signature matching adults and kids pajamas, using similar fabrics. These are very well received by the customers. Libella's comfy cotton sleepwears range from the smart classics, sporty bermudas, unique kimonos...to beautiful nightdresses for ladies and girls, versatile sleep shirts, dressing gowns, ladies' capris and long pants and many more.